3 for 2 Mix and Match on Cosmetics at Superdrug Stock up on your beauty essentials with 3 for 2 at Superdrug. An offer not to be missed. 10% Student Discount at Superdrug Get all you need from Superdrug today, use your Student Beans to save a bundle! Free Click and Collect on Orders at Superdrug With free click and collect, your essential shop can be your most convenient. Discover 50% Off Fragrance Orders at Superdrug Find your perfect fragrance with 50% off today at Superdrug! Get Triple Loyalty Card Points on Your Birthday at Superdrug Shop at Superdrug a lot? Get the loyalty card and you can enjoy triple points on your birthday! 1/3 Off Protein World Orders at Superdrug Take a third off the price of your Protein World products today at Superdrug. 1/3 Off Selected Hair Care at Superdrug - Including Pureplex and Love Beauty and Planet Keep your hair damage-free and save a bunch on selected hair care at Superdrug. 30% Off Max Factor Lipfinity at Superdrug Get a fabulous new look for your lips for less with 30% off Max Factor Lipfinity today at Superdrug. 3 For £3 on Travel Minis in the Holiday Shop at Superdrug Booked your holiday? Grab your essentials for less at Superdrug. Free Gift with Selected Orders at Superdrug Who doesn't love a free gift? Head to Superdrug and you can get one with selected orders today. Free Delivery on Orders Over £15 at Superdrug If you're spending over £15 you're in for a treat! You can get your goodies sent to you for free. 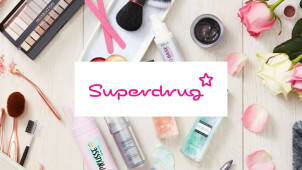 Check Out the Vegan Beauty Range at Superdrug - Skincare, Makeup and More Superdrug offers an amazing vegan range of beauty products! Have a look now and add them to your collection. Free Returns on Orders at Superdrug No need to worry if you change your mind, Superdrug offers free returns! For years, Superdrug has been a strong contender of go-to high street stores for all things makeup, skincare and toiletries. With a wealth of health and beauty knowledge on offer too, you can always find what you need at Superdrug. Shop with a Superdrug voucher code and it’s easy to cut the cost of your morning routine, cleansing must-haves and more this spring. With plenty of gift ideas too, plus everything you need to enhance your beauty regime, with Superdrug you will always look and feel fabulous for less. Superdrug has a Health & Beautycard which is designed to help you save more. As a member you'll find lower prices across tonnes of products, get free online delivery, a birthday treat, bonus points offers and more. It's easy to register online, plus, you can then download the app to keep your card digital and track your savings on the go! Perhaps you're looking forward to a break in the south of France, to a trip to Devon or to another lush retreat, if that's you, you'll need some travel essentials! The Superdrug sun care section has something for all skin types, and with a Superdrug discount code you'll save on healthy skin security. It could be for a romantic getaway or for your annual family trip, whatever the occasion, save on sun creams, oils and more from Superdrug today.